Bent Little Tree, Mauna Kea, originally uploaded by Eric Jeschke. 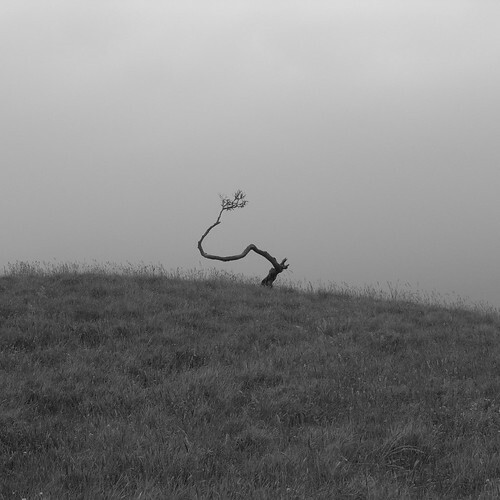 I have been picturing this bent, little tree for a while now, under varying weather conditions. I prefer the misty look, which it often is at this elevation. The tree just sort of hangs on, clinging to life, and I like that. It’s all alone by itself on a little hill, although there are others like it here and about. Eric, The trees misshaped form, alone on the hill and almost a silhouette against the misty gray background, presents a strong image–perseverance, tenacity, the struggle for life. I like it’s framed dead-center. It definitely works for me. I’ve been returning to this spot to photograph this tree again and again. I feel that I have still not quite captured the feel of the place and the tree. I will probably be trying again!